Imagine watching the U-M football team playing in a sold out Michigan Stadium on a sunny Saturday afternoon. But instead of cheering from the bleachers, you are being transposed right down to the field next to the quarterback. You are in the middle of the action. You can move to any position and experience the game from the player's point of view. You feel like being a participant, no longer a spectator. The technology of immersive virtual reality makes this amazing scenario possible. 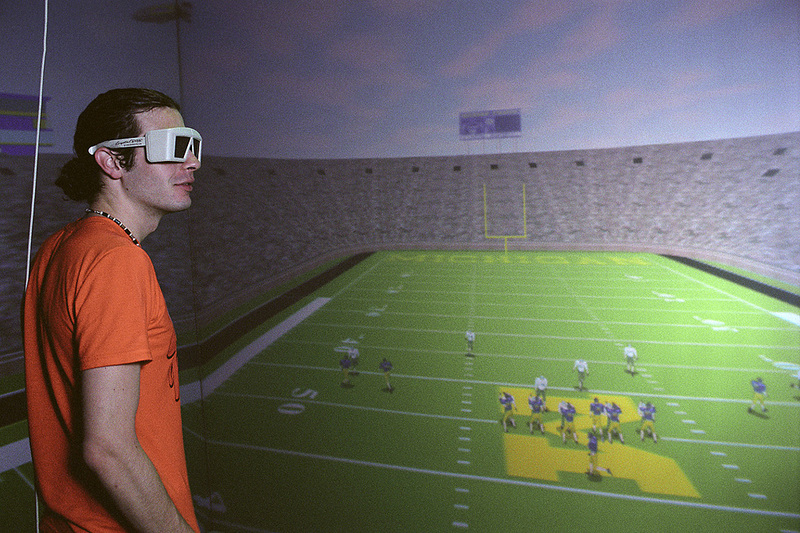 While video games allow you to explore a football play by looking at a computer's monitor, immersive virtual reality provides a much different and unrivaled experience: You are fully surrounded by the virtual players on the field, the players are presented in full scale and in stereo. It seems that you can touch them. You can look and walk around, hover over the quarterback, or even fly to cover distances quickly. The simulation of football plays in immersive virtual reality has a most useful and very promising application in the training of football players for specific aspects of a game. The University of Michigan Virtual Reality Laboratory has developed the concept for such a "Virtual Football Trainer" and has implemented a demo version that illustrates the potential in an already convincing way. 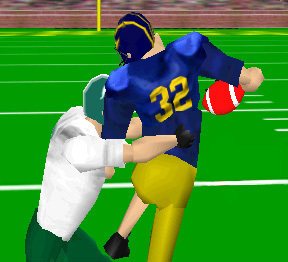 The original idea for the Virtual Football Trainer was inspired by the Lloyd Carr, head football coach at the University of Michigan. Generous funding for the development of the system came from the Graham Foundation and equipment support from Silicon Graphics Inc. The Michigan football staff provided continuous guidance and valuable expertise for the design and implementation of the Virtual Football Trainer. The CAVE (Cave Automatic Virtual Environment) is currently the most advanced system for immersive virtual reality. The University of Michigan operates such a system in the Media Union, an information technology center on North Campus. A CAVE provides its users with the convincing illusion of being fully immersed in a three-dimensional world that is computer-generated and presented to the viewer in realistic full scale as well as in stereo. A CAVE is a room-sized cube (typically 10x10x10 feet) consisting of three walls and a floor. These four surfaces serve as projection screens for computer generated stereo images. The projectors are located outside the CAVE. The users entering the CAVE wear lightweight LCD shutter glasses that provide three-dimensional stereo viewing. The effect is so compelling that the walls and corners of the CAVE are mentally blocked out by the human brain. The floor projection allows three-dimensional objects (like virtual football players) to appear inside the CAVE room and confront the user in a convincing way. Through the surrounding walls, the CAVE provides ultimate immersion and an extreme wide field of view. Peripheral vision is well supported and instrumental for orientation, navigation and, most of all, for the perception of movements that occur in the periphery. These aspects of the CAVE are instrumental for the Virtual Football Trainer. The objective is to train a player for the correct visual perception of play situations and for the fast reaction to the movements of other players on either team. Young players can go through countless repetitions of their own team's plays and learn the hundreds of formations, motions, and variations to an offensive and defensive scheme. An opponent's tendencies can be programmed and the simulation can be used to prepare QB's and LB'ers for anticipated schemes in an upcoming game. "In addition to field practice, I could spend time in the CAVE using simulated defensive players to help me in visualizing their blitzes versus our pass protections, time after time". 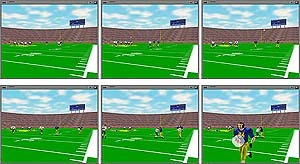 Coaches could use the Virtual Football Trainer as a priceless tool in the off season to train players. They could also visualize new plays to install in their own game plans. The creation of a virtual play begins with the design of a play chart that is entered in two dimensions using the "Chart Editor" program on a laptop computer. The players are presented by symbols. 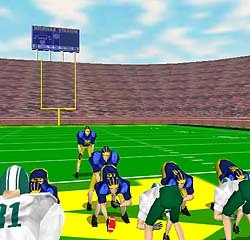 For each player, the initial position and the moving path on the field are defined via interactive graphics operations (using the mouse and pull-down menus). The play can be animated in two dimensions and the movements can be properly adjusted with respect to a time axis at the bottom of the screen. Play chart for the "Denver-Michigan-Chase"
The Chart Editor supports this process with a variety of useful functions including a library of pre-defined initial formations for all 22 players or a collection of pre-defined plays that can be loaded and modified. Players can be added or removed and properties like player's position, number, team (offense or defense), and others can be specified. The passing of the ball as well as the ball's flying path can be added and visualized. The finalized play can be labeled and added to a library. This most powerful component of the Virtual Football Trainer is fully automatic and uses artificial intelligence algorithms that create the three-dimensional animation for use in the CAVE. 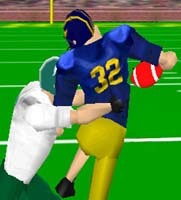 The 2D symbol for each player is replaced by a three-dimensional virtual player dressed in a team specific uniform and labeled with the player's number. The movements of these virtual players are created on a dense time grid. The algorithm recognizes if a player is walking, running, stumbling, tackling, and throwing or catching the ball. Using collision detection methods, interactions between players that come close to each other are handled properly. 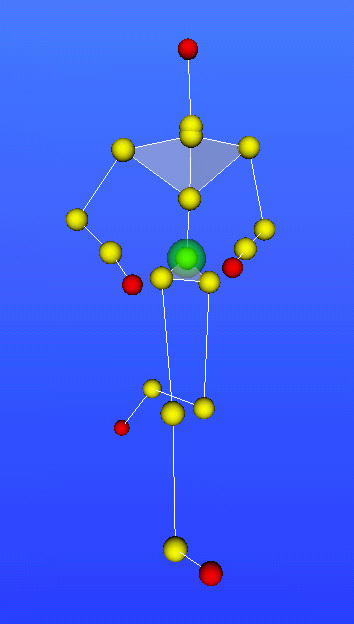 To obtain realistic movements, each player is animated via an internal skeleton consisting of about 20 joints. A library of hundreds of pre-defined poses and movements defines the positions and angles for these joints on a time grid. The pre-defined movements are automatically fine-tuned for a given moving speed and smooth transitions between poses and movements are inserted. The completed play animation is captured in a "Play-Script" file and transferred to the CAVE. The Virtual Football Trainer loads a given virtual environment (e.g., the Michigan Stadium) from a library and places the animated play at the proper location. In a typical training session, the trainee (e.g., a quarterback) is wearing the shutter glasses and is fully immersed in the virtual play. The trainer (e.g., a coach) sits on the side and uses a laptop to control the training session. A special menu in the Chart Editor program (previously used to model a play in 2D) provides all control functions for the CAVE. From the laptop, any previously modeled play can be loaded in any sequence. The animation can be started, stopped at any point in time, played in slow motion, or played backwards. Each play can be accompanied by sound selected from a library of audio clips. Most important are the control functions that relate to navigation. From the laptop, the trainee's viewpoint can be moved to the press box, the side line, or any other position (on the field or above) that provides a good overview for watching the animation. In addition, the trainee can be transposed to the precise viewpoint of any of the players on either team. A special and most impressive function lets the trainee assume the role of a selected player. In this navigation mode, the trainee's viewpoint is moved automatically with the viewpoint of the selected virtual player while the animation is running. During a training session, the trainer can also modify a play very quickly. Since he is using the Chart Editor program to control the CAVE, he can enter the modify mode, change the play, and immediately run the new animation in the CAVE. An alternative way to view and explore the three-dimensional play animation outside a CAVE system was developed. Using the VRML (Virtual Reality Modeling Language) standard for the World Wide Web, an entire play can be distributed over the Internet and viewed on the monitor of a laptop or desktop computer. 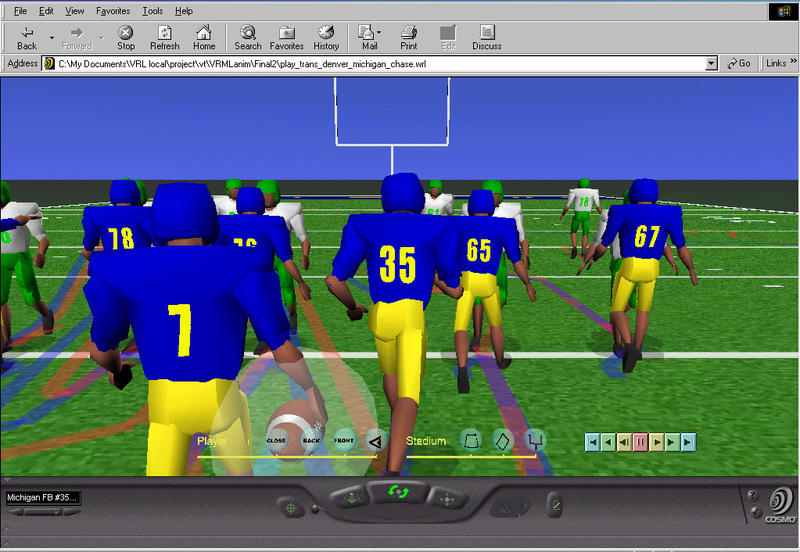 Coaches can provide players with these VRML files (on a CD or over the Internet) and players can study these plays at home or at any other location where a computer is available. The Chart Editor program has a function that automatically creates a VRML file for a previously modeled play. The VRML file contains all the animation features and control functions found in the CAVE application. Viewing the VRML animation, however, is non-immersive, but still useful. As in the CAVE, the VRML user can control the animation and, for example, attach his or her viewpoint to the viewpoint of a selected virtual player. The rapid development of virtual reality technologies opens opportunities for new directions in team sport training by investigating still unexplored areas of virtual simulations. The Virtual Football Trainer is a bold step in that direction and the implemented prototype illustrates convincingly the concept's usefulness and potential. Based on current practice, a two-dimensional play chart is the starting point for the creation of a three-dimensional play animation. The automatic generation of animated 3D virtual players from 2D play charts is a significant achievement that paves the way for the practical usefulness of the system. 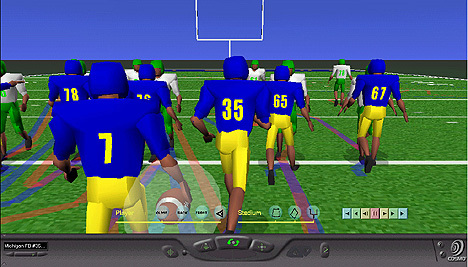 The Virtual Football Trainer allows coaches and players to study simulated formations and play variations from any viewpoint and as often as necessary. 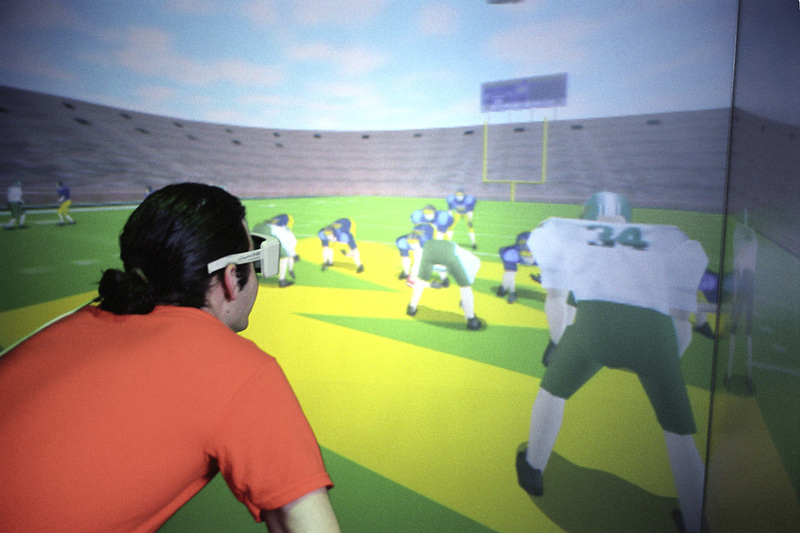 Training in immersive virtual reality can focus on the visual perception of a specific play situation, the correct estimation of distances, the awareness of the location of players on either team, the recognition of individual players (by size, statue, and player-specific movements), the visual communication with the coach on the side line, the exchange of players on either team, the signaling by the referee, the changing display on stadium billboards, or the familiarization with a specific stadium through a simulated walk from the tunnel onto the field. All these exercises can be conducted in a controlled environment and repeated with high precision, as often as needed, and in a short period of time. No stadium is necessary and no additional players are required to practice for a specific play. Even the unpredictable weather is of no concern. The virtual players consistently behave as they have been programmed, are always there when needed, and are never tired. Flexibility in the use of the Virtual Football Trainer allows for the study of play animations outside the immersive CAVE system. Play animations can be distributed over the Internet or via CD's for visualization on a laptop or desktop computer. In addition, large screen projection systems can be used for the discussion of simulated plays during team meetings. 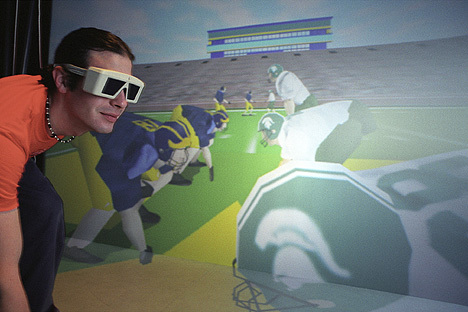 The Virtual Football Trainer, as developed by the University of Michigan Virtual Reality Laboratory, concentrates currently on the visual aspects of a football game. The innovative concept, however, is open-ended and can be expanded in many directions through further development efforts. The Virtual Football Trainer was developed by a team of students and research staff at the Virtual Reality Laboratory: Thana Chirapiwat, Mira Dontcheva, Bruno Janz, Lars Jensen, Denis Kalkofen, Joshua Levi, Joon Young Park, Diganta Saha, and Lars Schumann. The project was supervised by Klaus-Peter Beier. External guidance and advise came from Lloyd Carr, Phil Bromley, Tom Brady, Mike Elston, James Herrmann, Eric Graham, Robert Latsko, Brad Canale, Timothy Faley, and many others. This valuable assistance as well as the generous support from the Graham Foundation and from Silicon Graphics Inc. are highly appreciated.